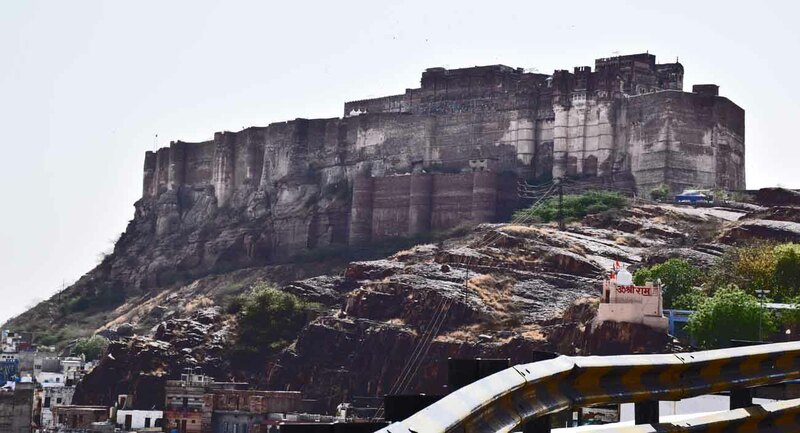 If there were an award for most amazing fort of the year that I dished out from my blog, then the clear winner for 2018 would be Mehrangarh Fort, sitting atop a rocky hill 420 feet above the blue city of Jodhpur. Okay, so I barely understand half of that, but I agree whole-heartedly non-the-less. 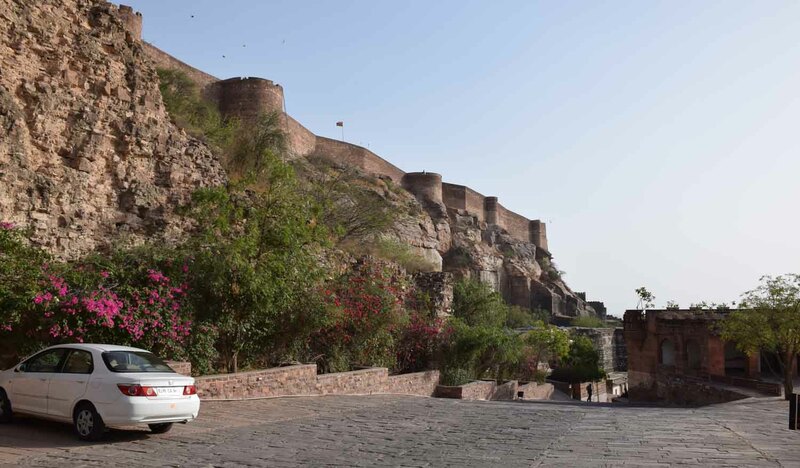 To get to the fort you can climb, or take a taxi or auto-rickshaw. I took an auto which worked out well because I was able to stop a couple of times on the way up on the longer road for photos. Climbing/walking was definitely, even though I didn’t do it, the harder option! 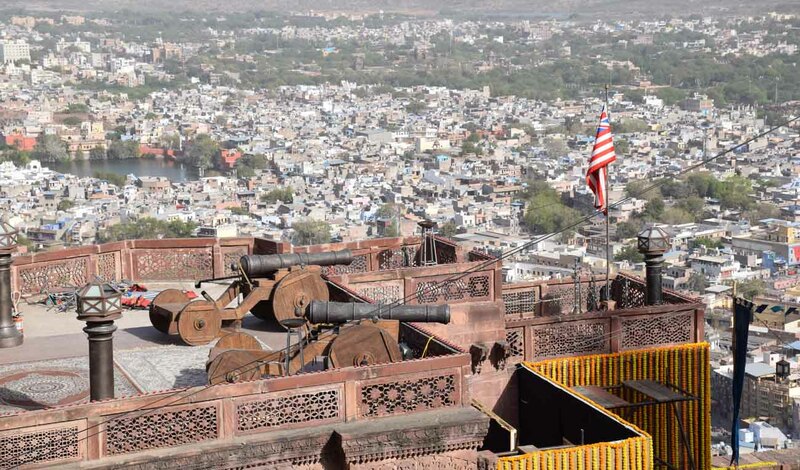 The position of the fort is nearly as impressive as the first itself, and you get amazing views of Jodhpur from up there too. 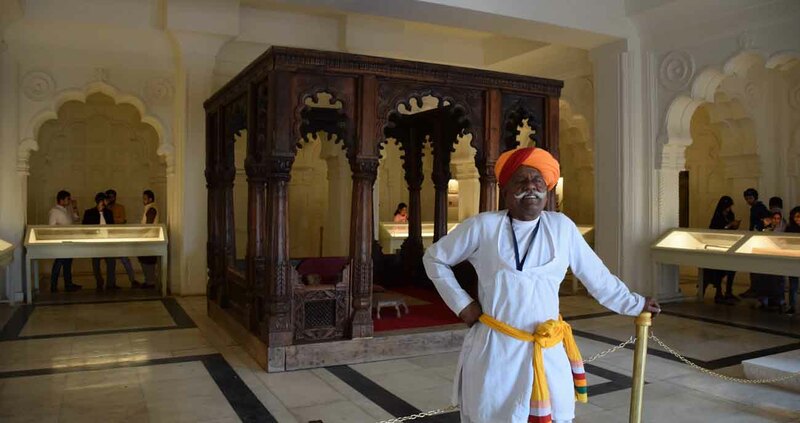 You can enter via several gates in the citadel, but to get to the museum you have to find your way to the ticket booth, which was close to the entrance where most people were getting dropped off, not too far from the temple Jaswant Thada. 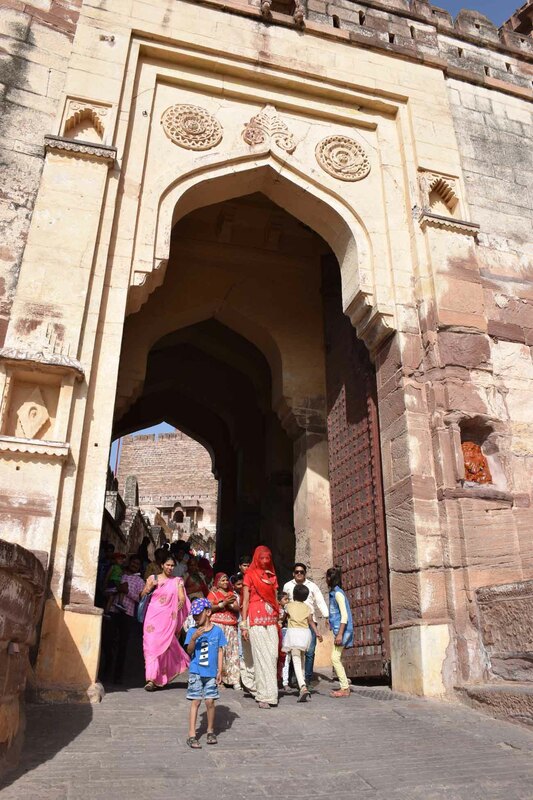 700 rupees made it the most expensive fort I visited in India, however that did include an audio guide in a variety of languages and also the camera ticket – more and more places in India are now charging separately for using a camera. Then it was a hike up to the entrance of the museum section. 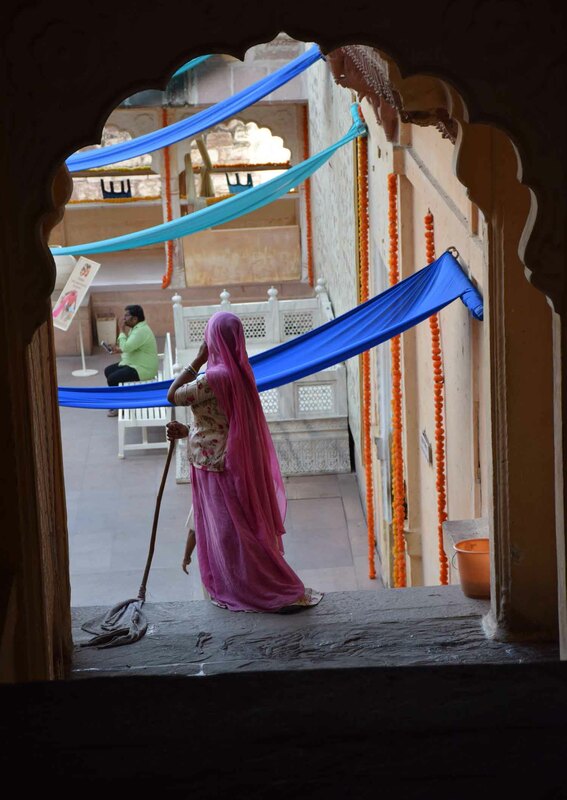 I walked past a man playing a sitar, and there were (possibly wedding) celebrations going on in other parts of the fort. The tour though seemed to be the royal palace section and it was amazing. Designed so you went on one direction only, it seemed I never went back on myself at all. Up, down, through thin corridors to balconies, royal chambers, displays, and more. Pictures do a lot more justice to the place than words. 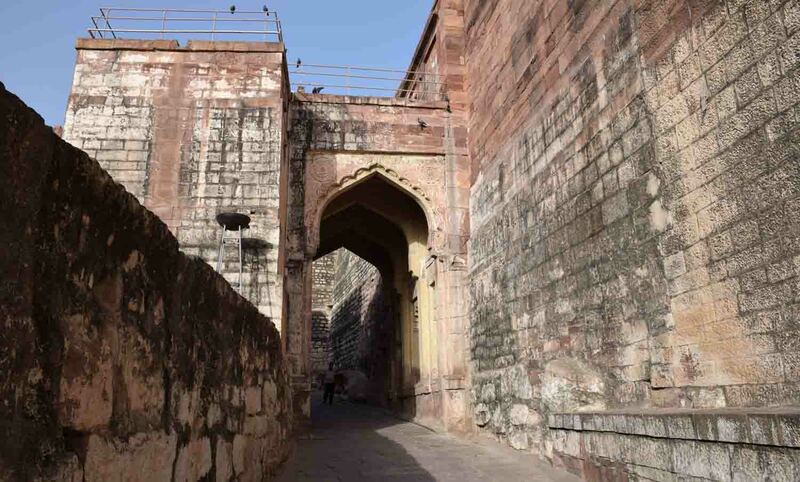 But I started in a courtyard below three or four storeys of palace. You looked up to see amazing lattice work, and that’s where I would end up a little later. 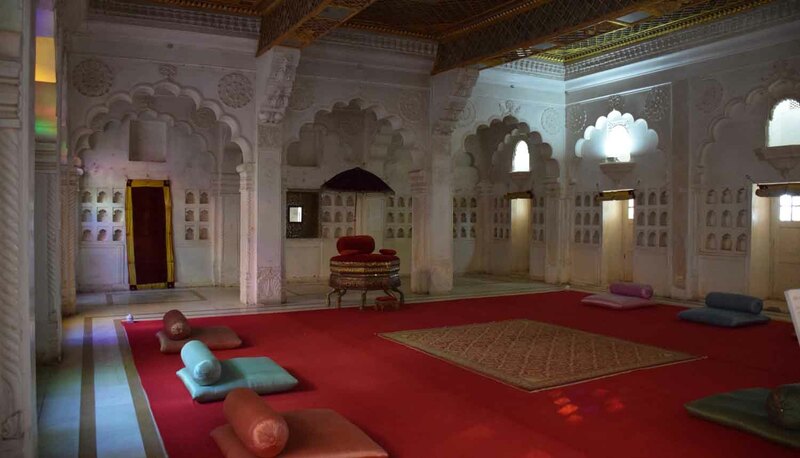 In the courtyard there was a turban-wrapping demonstration, and a large chamber with various artefacts to see. Then I entered the building proper. The audio guide was useful at times, but I find I only really use it when I see something that looks interesting and I need clarification. The stairways were at time small and claustrophobic, then the chambers would be decorated in great reds, blues and greens. 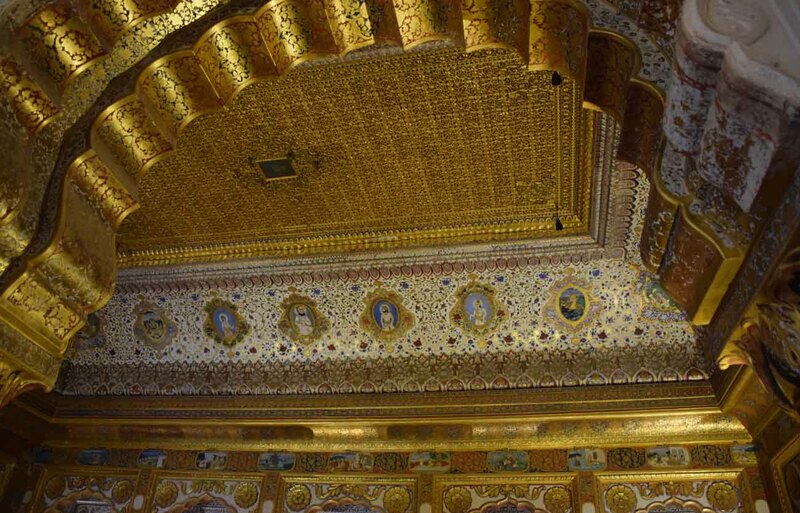 Archways, gold, marble… it’s all stunning. Suddenly I would find myself on a balcony or roof for photos of the city below, then back into the bellows of the place. I think I went through at least 30 rooms. And when you realise you are above the courtyard you started in, that’s pretty special. As were these little balconies, they seemed the place that girls might get serenaded. They also were right on the edge and frankly, a little terrifying! I exited from a different entrance. It was the opposite side and I had to find my way back. I must admit, I was confused and lost once I exited the fort. I just kept heading in the direction I thought the haveli was. 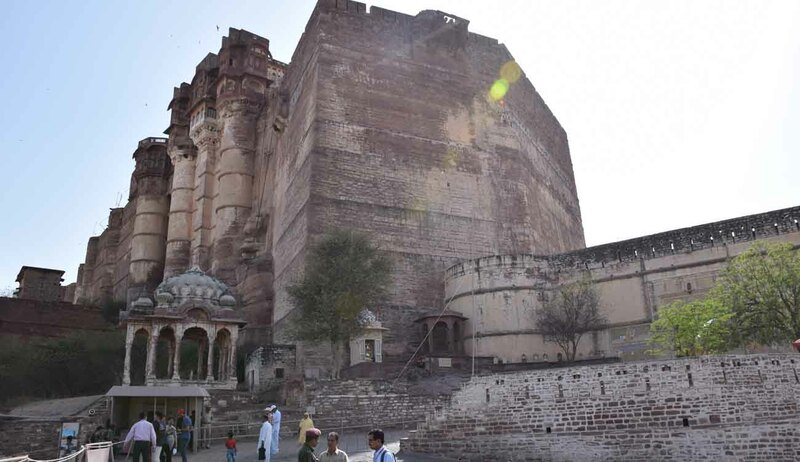 When I did get back there, with the help of an auto, I could look back up at Mehrangarh Fort, thinking how strange it was that I was just up there. 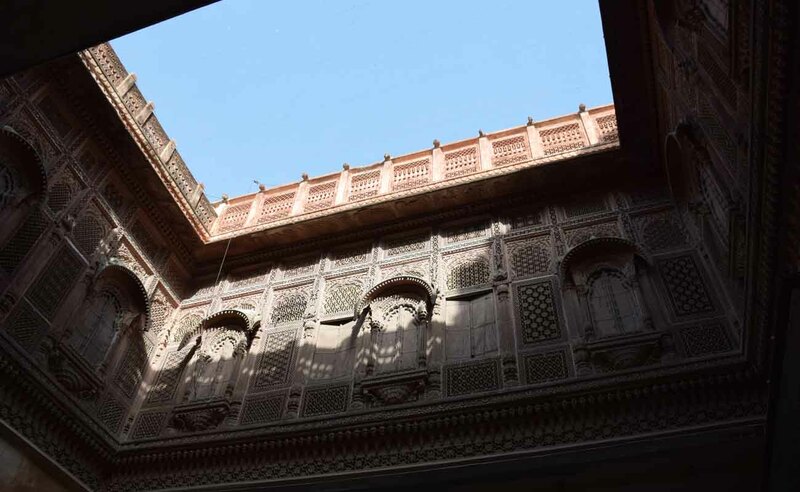 A stunning structure, a highlight of not just Jodhpur but all of Rajasthan! Thanks for reading – May the Journey Never End! 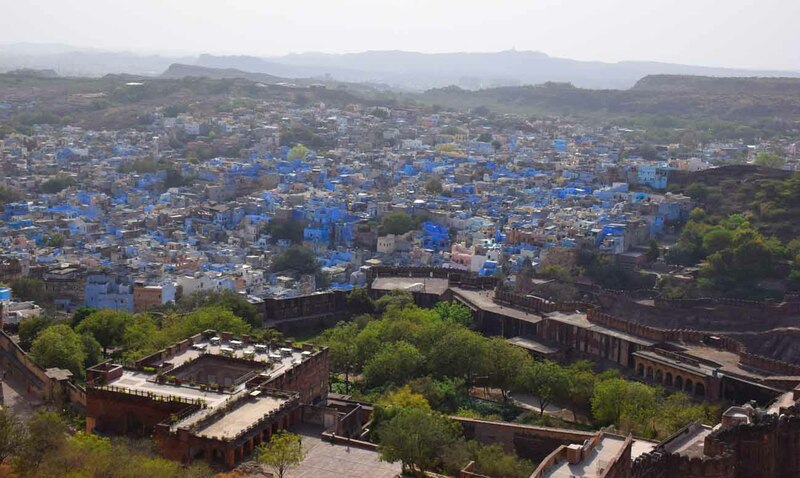 I haven’t been to Jodhpur yet but it seems definitely worth visiting, Andrew. 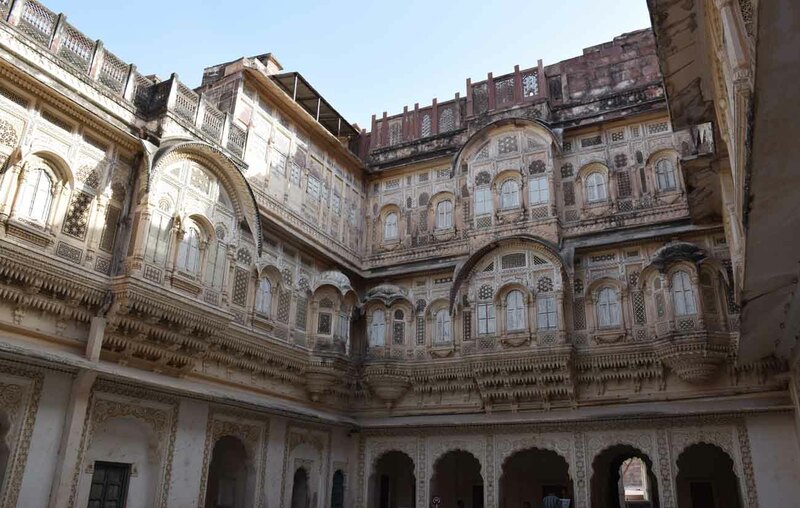 The Mehrangarh Fort is so charming. How many hours are enough to explore this fort? You need probably three, two at a minimum. Thanks for commenting and welcome to my blog! Oh wow!! I have not been to India yet but have heard about this beautiful temple. Looks amazing!! Yes I think it’s brilliant! 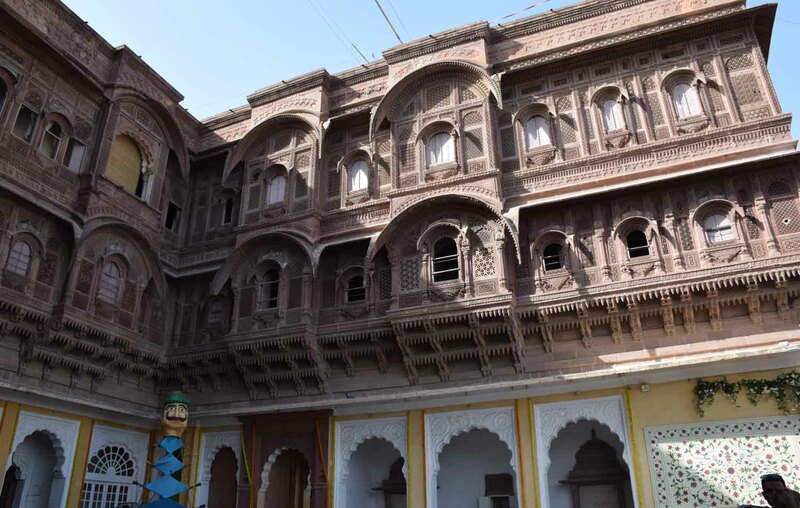 One of the best things to see in Rajasthan! Love love love this place! For me it was the audio tour that really brought it to life – highly recommended!